There are no rooms available at Britannia House for these dates. Generally children over 8 are welcome by prior arrangement. Parking: Limited parking is available on site and is free of charge. On street parking is available and is free of charge. Parking is available nearby at a charge of £5.50 per day. Tobi was the perfect host. Very friendly, very informative and cooked amazing breakfasts :). A great place to stay. 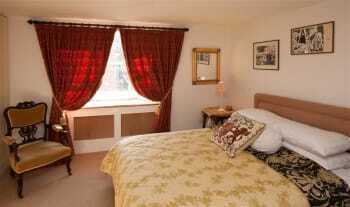 In the centre of Lymington but away from the hustle and bustle, a beautifully decorated and furnished gem of a B&B. Tobi was a helpful and informative host who cooked a superb breakfast. Would definitely recommend Britannia House. Lymington is an ideal base for exploring the New Forest and its surroundings. Good food served in the Kings Head on Quay Hill, would recommend the fish and chips! Enjoyed a weekend break at the fabulous Britannia House staying in the Britannia suite. 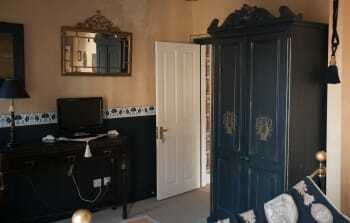 Very comfortable room with huge ajoining bathroom , leading onto the bright lounge . Tobi is a very attentive host , even surprising my husband with a thoughtful birthday gesture . His breakfast was great and his restaurant recommendations were very helpful . Would certainly recommend this hotel and will be returning again in the future. Contact Tobias the host for restaurant/ pub recommendations and reserve prior to attending as they are popular . 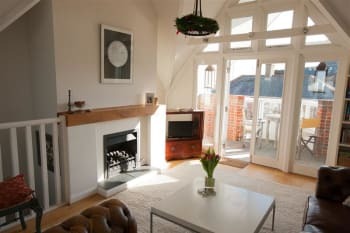 Great location in the heart of Lymington, ideal for exploring the south coast or the New Forest. Small friendly hotel with excellent service. Good location for New Forest. Cycle hire in Brockenhurst with great traffic free cycle routes. 3rd stay for us - this time to celebrate my 60th Birthday with family and friends. We had 3 rooms including the Apartment which is such a great set up and the unusually warm weather was a bonus. Tobi is a great host who delivers an ace breakfast every morning to set you up for the day ahead. Such a central location with parking!!! so everything is nearby. Nice big room, good breakfast, helpful staff. Dear Toby you were a wonderful host who made us feel most welcome. Your breakfasts are sublime but now we return to healthy eating unfortunately. You made us feel as though we were guests in a private home. Thank you. I am sorry we cannot personally recommend any local restaurants as following such a substantial breakfast we ate very lightly but from what we could see there many good places to choose from. Lymington is a lovely place just to wander around and relax which is just what we needed. 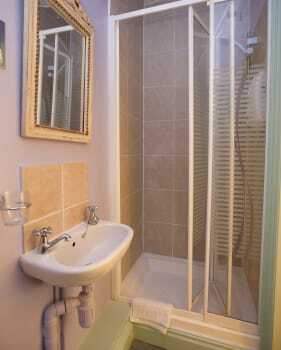 lovely and interesting house, room was beautifully decorated, spotless and very well appointed. Breakfast delicious, Tobias our host looked after us perfectly and was really warm and friendly. Great location in Lymington. Tobi was a great host and made a lovely breakfast. Knowledgeable about the local area and eating out nearby. We stayed in the apartment over the road from the main building which was a great base to explore the local area and very near the centre of town. Loads to do in Lymington and nearby either on the coast or in New Forest.Currently a show of British Wildlife Photographer of the Year in the local museum off the High Street. Lymington has a lot of independent shops as well which is nice to see these days. On arriving, we met Tobi, our host, and he showed us to our parking space, then to our apartment. What a fantastic apartment, it was spotless and everything you would need for your stay. Breakfast was very nice and being in an open kitchen with other guests, around a big table, or like us sat on a table for two, was good for conversation. I would highly recommend it, I didn't see any bedrooms in the main house but if our apartment was anything to go by then WOW!!! Been to Lymington before and do find that they have many restaurants and pubs to eat in. Excellent, very homely, superb breakfast. The Appartment was spacious and very comfortable. There is a very warm welcome and lots of useful information about Britannia House & Lymington, even for those making a short visit. Great location, cosy and comfortable room. Friendly host made us feel very welcome, and the breakfast was fab. We really enjoyed our stay. Eat at the King's Head. They have a good menu. We had a lovely stay with Tobi at Britannia House. We have been numerous times and will be coming again later in the year. 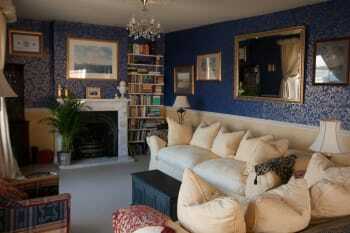 Great guest house in an excellent position to enjoy the lovely town of Lymington. Recommend the Elderflower for a special meal. Really excellent food and service. I was there for a one-night stay in respect of a business trip. The service received is up there with the best for accommodation I have experienced in the UK and I would highly recommend stopping there. 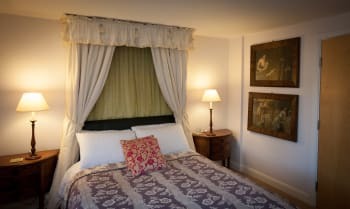 Totally loved our stay at Britannia House and we are already looking at dates to come and stay again with you in the New Year. 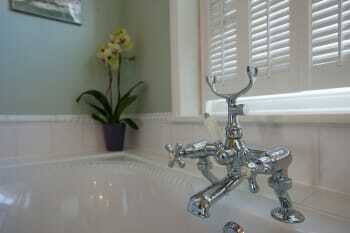 The best B&B in Lymington for sure! Tobias is very welcoming but not intrusive, making it very much like home from home. Location simply could not get any better, being 2 minutes from the High Street and quayside with great countryside on the doorstop too. The whole place is like a feast for the eyes, oozing charm, class and quirky humour in abundance. Loved it! Perfect location right by the station. Very quiet, and comfy beds, so a good nights sleep. Plenty of options for pubs, with the Bosuns just opposite serving great Wadworths 6X. Breakfast is great with plenty of choices. 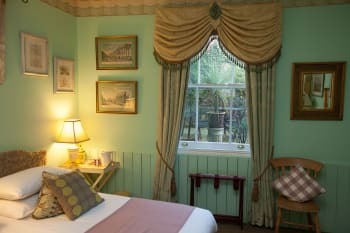 This is an exceptional b&b in a first class location. Tobi is a most friendly and obliging host. 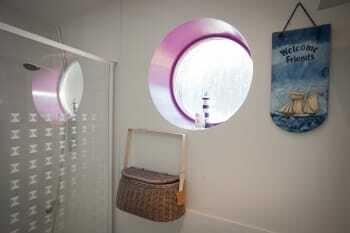 The accommodation is comfortable and full of personality. With parking and by the railway station. It is ideal to explore the town. We always visit the Saturday market and wander round the harbour. A special character of the New Forest close by. The Kings Head at bottom of the high street is currently our favourite for drink and evening meal. A fantastic place to stay with plenty of character and Tobi was an excellent host not to mention great cook, also very helpful in assisting locating places you were looking for. Lymington is full of nice little places to eat and drink, Stanwell House with its amazing atrium is lovely for a quite relaxing drink of an evening of The Ship down on the Quay for something a little more lively. The Beach Comber for coffee lookin out towards the Needles is a must. As is a stroll through the Forest at Brockenhurst. Toby very helpful and excellent breakfast cook. Great place to stay, great location. Toby is a very attentive host & full of tips where to eat etc. Rooms are spotless & beautifully decorated. We’ve been 4 times & it won’t be the last. We had an enjoyable stay with Tobi at Britannia House. We stayed in the apartment which is across the street to the main B&B so it was like having your own space with the added bonus of an outside balcony to enjoy. Tobi was very accommodating and friendly. The breakfast is very informal and the food is locally sourced and of superb quality. Only two minutes walk to the high street but such a quiet location. We will have no hesitation in staying again or in recommending Britannia House to any one. Thank you Tobi for a most enjoyable and pleasant stay. Although we stayed in the Apartment, we had a look at the other rooms in Britannia House. All are of a good size and are well appointed. The guest lounge is very spacious and comfortable if you should just want to sit and read and relax. NOTHING bad to say! 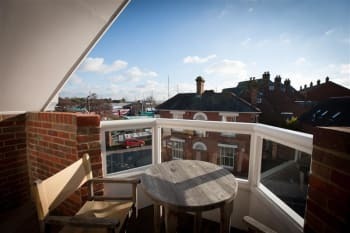 A delightful stay in a convenient location, lots to see and do in the area as well as being close to family, the main purpose for our visit to Lymington. Breakfast was excellent and the reception friendly and welcoming. One small observation was that the bed was a little soft for us! Thank you Tobias, we would definitely stay at Brittania House again. Tobias made us very welcome and nothing was too much trouble. Great breakfast !! Lots of great restaurants and pubs within easy walking distance. All good. Room clean and tidy. Breakfast good. Would stay again. Just across from railway station, short walk into town and to quay. Toby made us very welcome and the kitchen breakfast with other guests is a great start to the day. Toby is a wizz at coking eggs to order! Opposite is the rail station which takes you in 2 minutes to the ferry for the Isle of Wight. One of the best guest houses i have ever stayed in. Beats many hotels hands down. Tobias is a great host and cooks a very good breakfast. King's Head pub was fun. HUGE piece of fish with fish and chips! We are regular visitors to Lymington usually staying with Family but on this occasion we thought we would try the Britannia House. What a find!!! So central and quiet and easy to find everything. Tobias is a wonderful host and made us feel very welcome. We have already booked 3 rooms for February for a family celebration!!! Everything is so near - Nightcap at the Bosuns Chair - well rude to pass it by. We like Greedo for coffee and if you want a good walk then ending up at the Haven Bar is fun. Perfect location for exploring Lymington and the surounding areas. A very short drive to the National Park with it's wonderful ponies and donkeys. A warm welcome at The Bosans Chair and fabulous meals at The Elderflower and Koh Thai Tapas. 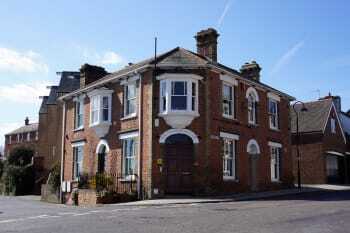 Excellent location opposite the train station for routes to Isle of Wight and Southampton. We had a great stay, Tobi was the best host with lots of siggestions of what to do and where to eat. Britannia House was perfect for a long weekend exploring the New Forest, great location in the town and right opposite the station. Toby was always friendly and helpful with a good sense of humour. Breakfast was excellent. A warm welcoming experience was had. Very friendly reception and service, breakfast was excellent and made our stay very enjoyable. Didn’t stay long enough as we were working but there was a very reasonable friendly pub across the road. 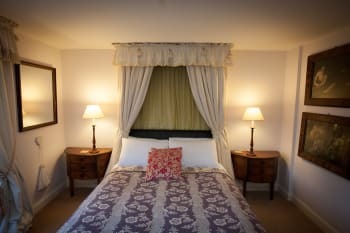 The perfect place for a stay in Lymington! Eclectic and quirky, with extremely comfy beds and a fabulous host, Tobias, who cooks the most divine breakfasts! 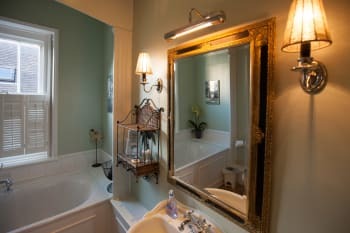 We will definitely return, and have no hesitation about recommending this lovely B&B. Most pubs and restaurants offer goof fair and if you like shopping nice high street. Take a walk along the the main harbour. 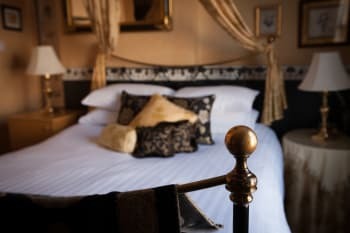 Very enjoyable stay, BB spotless, ideal location for town of Lymington and train station, nice pub next door to BB also. Recommend this BB, also lanes restaurant in Town, superb meal. A really lovely B&B with a wonderful host Toby who made us feel very welcome. Nice meal at the Ship Inn with lovely views from the terrace. Walk to the ferry and have a day on the Isle of Wight. We ate at the Ship a couple of times and were very pleased with the service and quality of food. When in doubt,ask Tobias and go with his recommendations. Lovely weekend stay. Thank you Tobias. Look forward to staying again. We would not hesitate to recommend Britannia House. 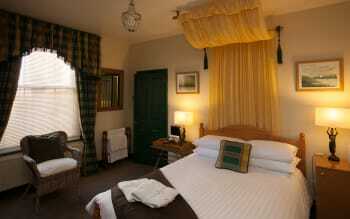 A lovely room, with character and personal touch, and with everything we needed. Tobi was a terrific host and took time to ensure we were comfortable. He was extremely friendly and personable, and altogether a great host. Britannia House was more of a home then a B&B, and we were allowed to enjoy all the facilities, including an upstairs living room. We would certainly choose to stay at Britannia House when next visiting the New Forest. Thank you. Take time to enjoy the New Forest - there is a whole wealth of things to see and do. A lovely area for a short stay or for a longer vacation. Tobi looked after us very well and we appreciated his kindness. We would certainly recommend Britannia House to anyone visiting Lymington. Tobi is an excellent host. His breakfasts are wonderful and freshly cooked. He has many suggestions for places to eat in the evening. Lanes of Lymington is an excellent choice for an evening meal. Friendly host and excellent breakfast. We were made to feel very welcome by Tobias and thoroughly enjoyed our time there. Tobi could not have been more helpful. The perfect bed and breakfast host. Nice restaurants and pubs with in walking distance. Would recommend The Lanes restaurant if you want a very nice setting, great food and lovely service. Perfect location and a lovely B and B. Would definitely recommend. Good value for money too. 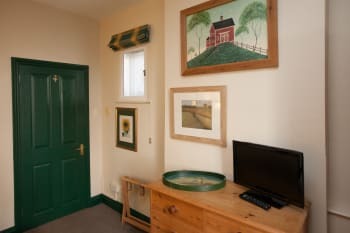 Britannia House is a wonderful place to stay and enjoy the New Forest. It's close to the high street/shops and transportation. Breakfast was fabulous and Tobias was a great host! I recommend a walk along the harbour and sunset dinner at one of the restaurants there - all fine dining. Durdle Door is not too far with lots of great hiking trails as well as hiking/cycling the New Forest! A wonderful stay at Britannia House. We stayed in the apartment, which was lovely, spacious and homely. Tobias is a great host, who makes you feel welcome from the moment you arrive. Breakfast is cooked in front of you, all lovely and fresh. 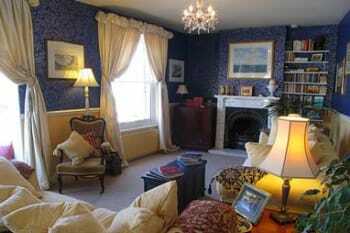 Britania House is one of the best bed & breakfast places I have stayed in. Would return without hesitation. We met other guests who return time and again. You won't be disappointed. Lovely breakfasts, very comfortable rooms. A home from home! 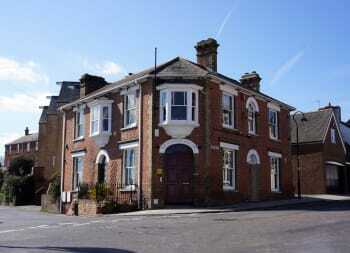 Britannia House is conveniently located near to the station and the town centre is within very easy walking distance. 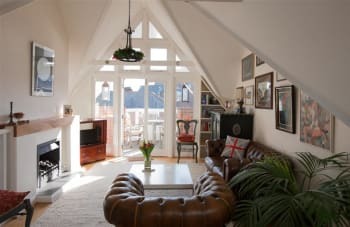 We stayed in the 2 storey apartment which had excellent facilities and was very light and airy with the living area on the top floor and bedroom below. Our host,Tobias, was very welcoming and cooks up delicious breakfasts to order in his rustic-style kitchen. We enjoyed walking along the coast and in the New Forest. We ate at the Bosun's Chair, conveniently located next to the apartment. 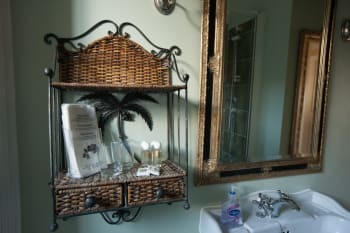 A lovely B&B with excellent service and attention to detail provided by the host Tobias. The property is conveniently located just a couple of minutes walk to the centre of Lymington and the quay. We enjoyed lovely meals at Lanes, Koh Thai Tapas,The Kings Head & The Haven which were all within walking distance. super location, excellent helpful host, very good breakfast. Bed and bedding was luxurious. 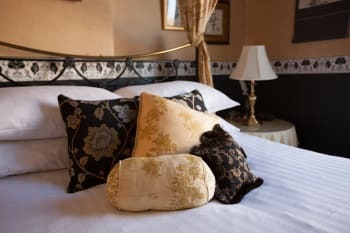 If you can get a booking here, do not delay - you may miss an opportunity for a lovely experience. A fantastic B&B, quiet location but only a couple of minutes walk take you to the centre of Lymington and some excellent eateries. Breakfast was amazing. Thoroughly enjoyed our stay. Nothing was too much trouble and the breakfast was first class. Kings Head pub evening meal good wholesome food. Tobias is a very welcoming host. We felt very at home. The breakfast was delicious. Would definitely visit again. I really appreciate everything you’ve done for me! I could have so wonderful staying everyday! Breakfast was awesome :) I’d like to come back here soon! The location is near the main train station, it is very convenient. There are some restaurants and shops around the hotel, you can go there on foot. Warm welcome.Excellent hospitality.Free parking.Very convenient for the quay side and high street.Very quiet at night. Very enjoyable stay. Made very welcome by the excellent hosting skills of Tobias. We will certainly be returning to the britannia. Recommend the kings head and ship inn. Food really good but would book. Always the perfect break, in the perfect location. Excellent stay as always. Tobi looks after his guests really well and you get great value for money. Very warm welcome from Tobi. Excellent breakfast. Train station a few minutes walk away. Particularly handy for travelling to Southampton for the boat show. Just a 15 minute walk to IOW ferry or one stop on the train. 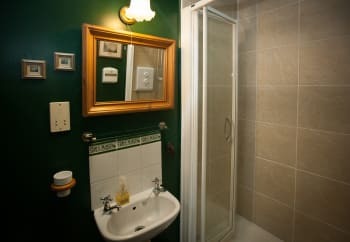 Lovely accommodation, very conveniently located near the town centre, Tobias the owner was extremely helpful and courteous and cooks a fabulous breakfast ! Will definitely come back and stay again. Lymington is a great place to visit with plenty of bars, restaurants, shops and a wonderful little harbour. Friendly host. Good hot full English breakfast Large towels. Nice room. PArking outside. Great B & B. What an amazing place to stay! It was so quirky and original, everything about it was fabulous. Lots of space in the lounge to sit and chat. Tobias was a faultless host. Such a lovely man. Thank you so much for our stay. Lovely accommodation, fantastic breakfast, good location and lovely Toby made us very welcome. What eise do you need?! Excellent in every way. Relaxed and friendly whilst providing and respecting privacy. 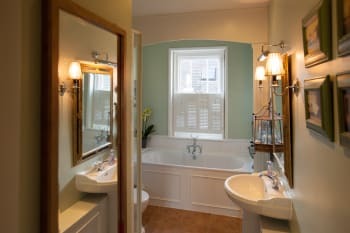 A unique blend of b & b with upmarket boutique hotel in many respects. Must be tried. Ideally located for New Forest, Isle of Wight and Lymington itself. 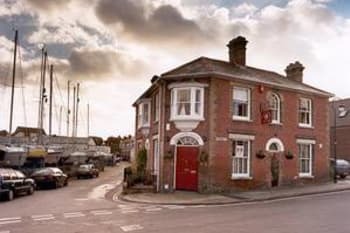 We love eating at The Ship, which is right on the quayside of Lymington with a definite sailing vibe and near enough for a very gentle stroll back to Britannia House. Our stay at Brittania House got off to an excellent start with a free upgrade! Our host Tobias was charming, helpful and amusing. Our room was very clean and comfortable and our breakfast was excellent (the only thing missing was black pudding, which for a northern lass is important addition.) Despite the rain, we had a wonderful stay in Lymington and would not hesitate to return to Brittania House – highly recommended. Very comfortable room for a two night stay. Attention to detail, excellent breakfasts. Very convenient for the harbour and town. Would definitely book again. Lovely room. Delicious breakfast. Hope to return in the future. Beautifully decorated and comfortable room. Parking very useful. Great location,so handy for town. Delicious cooked breakfast. Very helpful tips given for restaurants in Lymington and surrounding area. We enjoyed our stay very much, thank you. We had a fabulous meal at the Elderflower Restaurant in Lymington, very special. The apartment room was excellent. Spacious, clean and tidy. Breakfast was lovely and of course service - top class. We really enjoyed our stay. The location is perfect for both the train station and the ferry to the Isle of Wight. Toby couldn't have been more welcoming. We enjoyed so many great breakfasts and chats with him. The accommodation was excellent. We really felt at home at Britannia House. Really enjoyed Beaulieu and walks along the Solent. Took the train to Winchester for the day. Had a great tour of the cathedral there. Enjoyed Market Day in Lymington and walking along the waterfront. 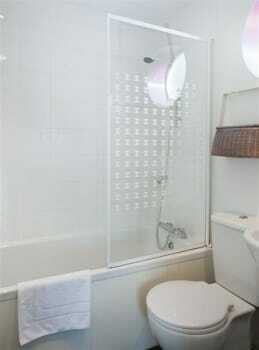 Central location with easy access to pubs and restaurants in the centre of the town and the Quayside. With on site parking it’s easy to drop the car and get everywhere you might want to get to on foot. Very clean and tidy with good quality food. Love this place. Tobi provides a great breakfast and is an excellent host. Been here at least 4/5 times now and will be back again. 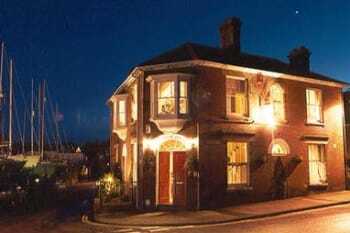 Lymington has numerous great restaurants. Out favourites are Monkey House, Kings Head and Chequers. Some great walks along the coast to Milford and Key Haven. Superb Location & Accommodation. The Host is Great Cleanliness is Imaculate. Breakfast superb! Central Location great Pubs & Restaurant's. Isle of Wight Ferry near by. Excellent cycling, walking and places to visit. The elderflower restaurant makes for a very special evening. Very friendly helpful host. Lovely room. Nice walks around the coast / marina. Helpful advise about were to eat. Nice local shops you wouldn't find anyway else. Really enjoyed our stay in the Apartment, it was perfect. Tobi was both welcoming and informative. Kerry was a delight and cooks an absolutely fabulous breakfast. Would definitely recommend the Britannia. A very comfortable,clean, interesting guest house. Great host who is very welcoming and accommodating and cooks a perfect breakfast! Great location. We would defiantly return . We were only there for an overnight stay but, if you have children take them crabbing. We had a great short stay here. 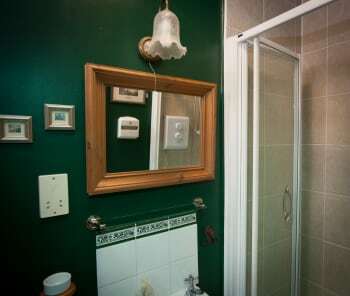 Tobias the owner is very personable and helpful and standards for a small B and B are exemplary. We'd definitely book here again. Lovely picturesque town for wandering around in. Great market in the High Street on Saturday. Good choice of food available. Walks around the marshes and further afield to Hurst Castle and beyond are recommended. What a delicious breakfast. I think it was the best we have ever eaten. Super place and very near to the town. Will definitely stay again if we are in the area. 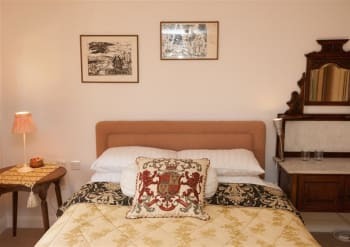 Very high quality B&B in great location with friendly service. Excellent breakfast with great ingredients well prepared and served by Tobias. Had a great meal at The Shipyard which offered great ingredients (lovely fresh fish) well cooked with friendly service and a good wine list. Enjoyed drinks at the Cellar- Good wines and cocktails. Our visit to Exbury Gardens was an absolute treat - at their very best in late April.We also enjoyed our trip to Bucklers Hard and the lovely riverside walk from there to Beaulieu as recommended by Toby. The host is very polite, friendly and helpful. We recommend The Elderflower restaurant for an intimate evening meal. Go to The Ship Inn for a pub lunch/dinner. Really good place with excellent host. Ideally located with for shops, restaurants and the marina. Tobias is a great host - the accommodation is excellent and his breakfast really enjoyable. It is also very pleasant having breakfast with Tobias's other guests around the one table. We had a great time in Lymington and really enjoyed staying at Britannia House. If it is available book the apartment as it has the benefit of a lounge and a great balcony. There is plenty to see and do while based in Lymington - the Isle of Wight, Exbury Gardens, Hurst Castle ( take the ferry) and of course the National Motor Museum. Tobias made us feel valued, and welcome. We would certainly stay again. Ask Tobias. Kings Head good pub grub. Elderflower very good quality food, reasonable prices. So much to do and see in the area. Kings Head is THE place to eat. The food, ale and wine in perfect in every respect. The portions are huge and excellent value for money. Wir haben uns im Britannia House sehr wohl gefühlt. Der Eigentümer hat uns gut bewirtet und uns mit vielen guten Tipps versorgt. Falls wir wieder nach Lymington kommen, werden wir wieder im Britannia House absteigen. Really enjoyed our visit, breakfast was fab and so was our host Tobias! Really lovely bedroom and sitting/kitchen room. Great breakfast room, very friendly and I enjoyed my cereals but although I am not a fan of the fried breakfast it certainly looked good on other guests' plates. Kerry was most welcoming and helpful. I loved the friendliness and home comforts of Britannia House. Close to the heart and marina of Lymington. Go to The Fishyard Restaurant for an amazing fish dinner. Also wander around the marina and see how the rich live! Many independent shops and a good market on Saturdays. We greatly enjoyed our stay and Kerry was a super hostess, since Tobi was away at the time of our visit. He is very fortunate to have such a reliable, welcoming person to manage affairs in his absence. We enjoyed visiting Mottisfont & Hinton Ampner (both N.T.) The walk on the shingle spit to Hurst Castle is invigorating, and there is quite a lot to see at the castle. Lymington is a delightful place with a profusion of individual shops, cafes & dining options. 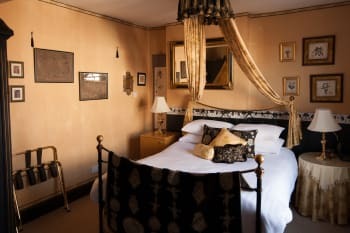 A masterclass in bed and breakfast, by far the best establishment of this kind we have stayed in, a real home from home. Great position in the town, near the harbour and main street, excellent base to walk from tomthe coast and surrounded by a great assortment of restaraunts. 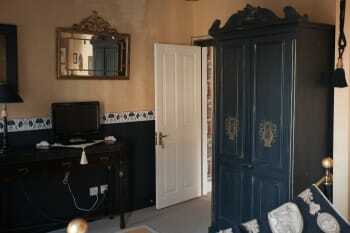 Excellent host, ideal location, quiet yet close to town centre and all types of eating places, great centre for touring. Room was one of the best we have stayed in. Comfortable, roomy, very good bed. Better than we could have hoped for. Thank you Tobi. Very well run family business, great host and fab breakfast, parking a bonus, pub across the street and within reach of everything by foot. Well this was a really unexpected surprise! 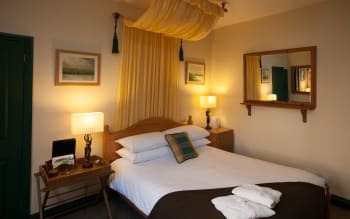 It's always difficult to get the full picture from a web site, so when we arrived at Britannia House we were expecting... well, you know, just another hotel. How wrong we were! Greeted with a smile and chat at the door by Tobi, we were shown up to our room (the black and gold room) which turns out to be more like a suite, with a separate bathroom (big bath, monsoon shower) and adjacent to the "library" lounge with its comfy sofas. Armed with wise words of advice from Tobi about the best places in town to eat, we ventured out into the beautiful late October sunshine... we didn't need directions to find the quayside, we were already there (such a great location) and wandered along the quay, stopping in a pub or two, until we got to the Yacht Haven where we sat in the glorious sunshine, watching the boats and chatting until the sun went down. And we had a sumptuous meal there too, incredibly fresh and delicious Turbot (as recommended by Tobi). Back at Britannia House, our room was perfect - and very comfy. Next morning, breakfast was another (wonderful) surprise - we sat in the "farmhouse" style kitchen and chatted with Tobi as he made our breakfast (full english naturally... yogurt and cereal also available!). It was a wonderful couple of days (Lymington is gorgeous too) and a wholly unexpected experience. To be honest, we felt more as though we were staying as Tobi's guests in his house, rather than "hotel residents". We will be going back, no doubt about that, and we would thoroughly recommend you give Britannia House and Lymington a go too! Walk along the quayside! Beautiful... and you can walk for about three miles (i think!) to Milford, or stroll for a mile or so and then loop back down the lanes into town. Britannia House is adjacent to the (very quiet) railway station, so great if you don't have a car. Eat and drink at The Yacht Haven - amazing!! And drinks (and i'm sure food) at The Ship Inn on the quayside are highly recommended too. But if you're staying at Britannia House, ask Tobi - he can be trusted! Relaxing stay. Immaculately kept rooms and stayed across the road in the annex which had a very nice separate living room with balcony. Try the Kings Head for good food and huge portions The Elderflower was entertaining, very modern and oh so tasty. Kings head Pub, great food. The new forest tour bus was not very helpful. 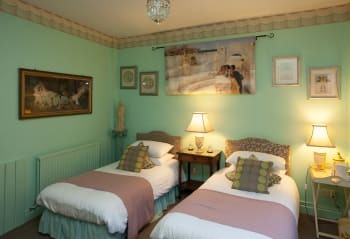 Having stayed in the New Forest many times before we found this B&B really central for walking, attractions, restaurants. The accommodation was excellent with great breakfasts. Very friendly and helpful host. Clean rooms and lovely freshly cooked breakfast. We only stayed one night after a sailing experience. Next time would stay longer and explore the area more. Tobi is an excellent host who runs his business very well. Nothing is too much trouble and he is warm, helpful and conversational. A lovely find in Lymington. 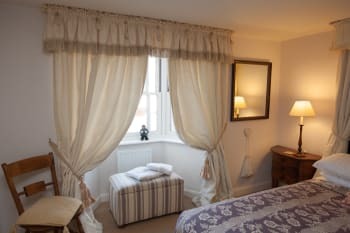 A traditional town house with every facility beautifully furnished - a very relaxing place to stay. Tobi was an fantastic host, most helpful in suggesting good places to eat, and not a bad chef himself!! An excellent breakfast with convivial company. Very close to Lymington Town station and handy for IoW ferry. Would certainly recommend highly. Thanks Tobi. The Haven is a lovely place to have a drink overlooking the marina, and we found the King's Head in the town a great pub for meals. Nice to see some independent local shops. Kings Head excellent for food but need to book. Good, moderate walking over shingle path from Milford on Sea to Hurst Castle. Very friendly and great cooked breakfasts! Excellent hospitality from start to finish. Would recommend Tobi at Britannia House without hesitation. This place is a little gem and the host Tobi was superb and also cooked a fabulous breakfast our room was the Brittania suite and it was lovely superb comfortable bed with first class linens and a huge bath the upstairs lounge area with views over the boat yard is a bonus too we have booked a return trip already! Very friendly, helpful and efficient service. Friendly welcome, very clean rooms. There's plenty to see nearby with shops and restaurants just a few minutes walk away. It's easy to drive to the coast or into the forest from Lymington. Lyme Fish Bar excellent fish and chips to eat out. Had a great 4 night break here. Our particular accommodation was excellent and better than expected. We loved the slight quirkiness of the place. Farmhouse kitchen with toby cooking breakfast to order. Would love to stay again. Day trip to Isle of Wight very good. Toby makes some helpful recommendations for restaurants etc. in his folder in room or just ask him at breakfast. Tobi is a wonderful host. He was very accommodating and kind. The breakfast was out of this world, best bacon! The accomodation was very good.lovely comfortable bed . The owner of the hotel Tobias was very welcoming and freindly. Lymington is a lovely Town with a nice Harbour and plenty of restaurants. An unusual, quirky establishment providing an efficient yet relaxing service. I liked the laid back approach of the owner Tobi who was most welcoming and very knowledgeable about the surrounding area. The perfect base to explore not only Lymington but the New Forest and further afield too. Our three nights' stay in The Apartment was an extraordinary experience. Tobias gave us the warmest of welcomes and guided us to our off-street courtyard parking place, reserved for us exclusively during our stay. 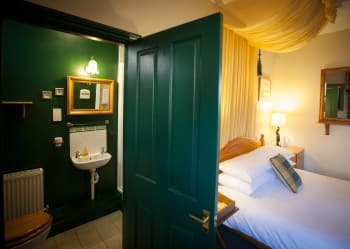 The bedroom was lovely with an entire wall of wardrobe space; and there was eye-level-to-ceiling shelving in the bathroom for toiletries, and a hook on the back of the door. The pictures on the walls were very nice. On first sight of the upstairs sitting room we were amazed. 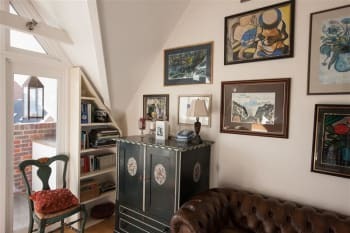 The whole room was beautiful, light and airy, with walls covered with wonderful paintings and etchings done by Tobias's godfather. All was either useful or beautiful, and mostly both. Breakfasts in the main house were excellent; cooked within view by our very efficient host, who managed to carry on interesting conversations with guests while both cooking and serving. Tobias's efficiency was only trumped by his kindness and acute eye for attending to any little thing he could do to take care of his guests. We were sorry to leave and are looking forward to returning. This is in an extremely convenient location, both for the train station across the street and for the downtown and quay. It was quiet as well. Having spent the past two days staying here. 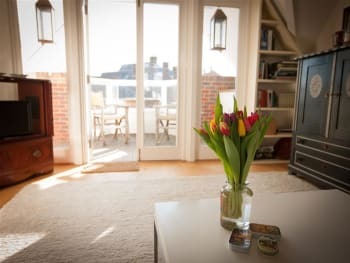 We cannot praise our stay highly enough.We were met by the host Tobias who made us feel very welcome, he took our case up to our room, which was delightful, certainly not a bland impersonal room. 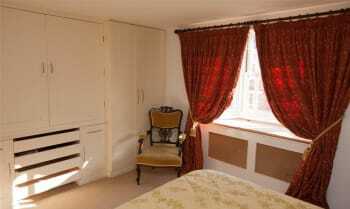 The bed, the bedlinen and the towels were of an exceptionally high standard. Breakfast was personally cooked by Tobias at a time that we requested, and again it was exceptional. We will be sure to make a return visit! Jane and Dave Wainwright. Fantastic place in a great location - we really enjoyed our stay in this charming B&B - breakfast was excellent - Tobi was a warm and friendly host and we will definitely be back at some point in the future! Tobi was an excellent host and made us feel at home. Yummy breakfast and great coffee! We thoroughly enjoyed our visit to the Elderflower Restaurant in Lymington. Great location - only a couple of minutes walk to town centre and quay side. Tobi looks after everyone who stays and is very polite and rooms are clean and what you would expect. Breakfast is cooked fresh and sets you up for the day. Lymington is a great location for a few nights away with some great pubs and restaurants to eat during the day and evening. fantastic host and scrummy breakfasts. Thank you Tobi. we will be returning in July. Enjoyed dinner at Elderflower, The Haven and The Kings Head but beware the fish and chips which could have fed a family of 4 !!!!! Tobais was very welcoming and helpful. We found the location ideal and would stay here again. Great location for visiting Winchester by train. If you like gardens or gardening the Sir Harold Hiliers gardens near Romsey are a must. The Haven restaurant is in a wonderful location with great seafood. Very warm welcome. Felt very comfortable from the moment we arrived. Was a pleasure to meet Kerry (what a lovely girl). Thank you for a lovely stay. Chill out, lots of good restaurants and pubs, what more do you need ? absolutely great as stated in my trip adviser review. Great room in a fab location. Thank you Toby, lovely stay. Great breakfast. 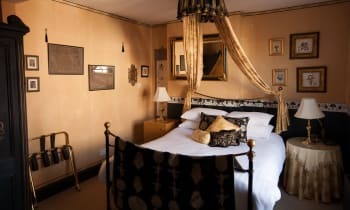 My only critism is that I though I was booking Britania House instead we ended up in a room in a town house across the road which was a disappointing start to our break. The bed was amazingly comfortable. Excellent breakfast the following morning. Very friendly welcome from Tobi. Excellent English breakfast too ! Relaxing and great place to stay with home-from-home atmosphere. Warm (and in our case understanding) welcome. Excellent breakfast. Lovely bed/bathroom. Location close to town centre/quay. Home to Guiness Book of Records collection of cheese trays. Home to a charming and intelligent international host. Home to invisible Swiss wife, who we assume is equally charming. Stay as long as you can! We only managed two nights... not enough. Will return. Very convenient for station. Lovely, clean rooms with a comfy bed. Very nice breakfast. Kings Head, lovely roast dinner. Angel and Blue Pig, interesting pub. Burnt Orange Cafe, really nice, Earley Mews, just before Angel and Blue Pig. Good for long walks. Very welcoming a good central accommodation to stay, very good breakfast, reasonable price for short stay thanks. We didn't really stay long enough to find out we will stay longer next time. A lovely place to stay in a great location. Our host Tobi was friendly and welcoming and also a great cook....breakfast was superb and will definitely visit again!!! Thank you! Local bars/restaurants all within walking distance. Great location and lovely facilities. Toby is a lovely host and great cook. One for the bikers-visit Sammy Millers museum! We had a lovely stay, despite the weather! The breakfasts are great and we would definitely recommend. Thank you Tobi. Best nights sleep myself and my wife have had anywhere, every peaceful. Perfect location and the owner was a true gent. Would recommend this place to anyone. Many thanks Tobi for another enjoyable stay at the Britannia,we were made very welcome. Will definitely be back. Really lovely B&B in a great locations, with a very friendly and helpful host. We had a great stay. Lovely stay and Tobi is the prefect host. Would certainly come again! Made to feel very welcome by the owner. Stayed in apartment which was quite special. 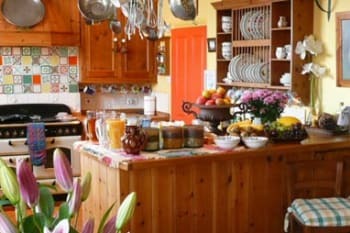 Delicious breakfast in lovely characterful kitchen of main house. We enjoyed a meal at Egan's restaurant. A small, seasonal menu cooked and presented very well by lovely staff. An alarm clock in my room would have been helpful. We would thoroughly recommend Britannia House. Great accommodation and terrific breakfast. The owner Tobi will make you very welcome and made our stay all the more memorable. We enjoyed the central location. Dinner at The Ship, Angel and Blue Pig. Coffee at The Haven Marina and Ciaa Bella were all good. Very friendly and welcoming. A beautiful characterful house with a cosy atmosphere. The lovely drawing room upstairs has an excellent view over the marina. The location was quiet and convenient for the town too. The owner is ready in the morning to cook breakfast, fresh and to your requirements. We had a very enjoyable, quality break and would be very happy to repeat the experience. There is an excellent restaurant (Egan's) and cosy pub that serves good food (The King's Head), both just around the corner. We rated both very highly. We are boating enthusiasts so we thoroughly enjoyed walking towards the water to view the boats. It is a very lovely location. Kings head pub food is nice, good fish and chip shop nearby too. Very enjoyable nights stay. Kerry made us most welcome on arrival as Toby was away. 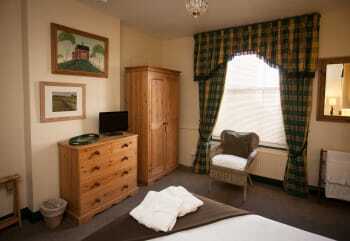 The room (the New Forest Suite on the ground floor) was really cosy and comfortable . The cooked breakfast was exceptional and all beautifully served by Kerry. We had the pleasure of meeting Toby just before leaving couldn't meet a nicer person. 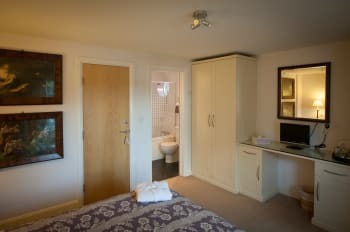 Unique rooms, excellent location,good quality bedding towels and breakfast. Very welcoming host. Lymington is a lovely town. So much to see & do. Visit Keyhaven too,walking in this scenic area will recharge your batteries. Warm welcome. Run of the house quickly extended. Delightful unique suites and large sitting room. Breakfast taken with hosts in kitchen made for family atmosphere. Fantastic location 5 minutes walk from all that Lymington has to offer. ! minute from station. Take host's recommendations for eateries and you can't go wrong. Tobi instantly made us feel right at home and was a great host through out the stay. We couldn't have asked for more from the room and breakfast was delicious with lot's of interesting conversation. Would definitely visit again and highly recommend to couples of all ages! We had an excellent meal at La Vina the local Tapas bar on the first night (cocktails were 241) and would also recommend trying out the Ship In and the New Forest Ice Cream parlour - friendly service and yummy food. I cannot recommend Britannia House highly enough - Tobias is an incredibly hospitable host, and his accommodation is absolutely impeccable. I was hugely impressed by his art collection in particular. Tobi could not have been more helpful during our stay, he is consummately professional and we look forward to returning! The duplex apartment is a really luxurious hideaway - perfect for a long weekend. We had nice food in The Old Ship by the Town Quay.